Over 50 years ago, the Dodge Charger was first introduced as a concept car, and after several years of design and production, the very first Dodge Charger was released in 1966, powered by a 318 cubic-inch V8 engine that generated 230 horsepower. For a little more power, a 425-hp 426 cubic inch “Street” HEMI V8 engine was an option to consumers, making the Charger the strongest two-door sedan in its class. Not only that, but most disregarded the Charger as a sedan and put it right up there with the Dodge Challenger as another muscle car in the Dodge lineup. Now in its seventh-generation, launched in 2011, the Dodge Charger is still going strong. Not only that, but for the 2017 model year, Dodge reintroduced two variations of the classic Dodge Charger Daytona. Two years ago, 2015, Dodge released the Dodge Charger SRT 392 and the Dodge Charger SRT Hellcat. No one could call these cars a sedan, as they were engineered by Fiat Chrysler’s advanced street and racing technology (SRT) team for true muscle. Powered by a 6.4L (or 392 cubic-inch) V8 SRT HEMI MDS engine, the Dodge Charger SRT 392 generates 485 horsepower and 475 lb-ft of torque. Paired to a TorqueFlite 8-speed automatic transmission and a rear-wheel drivetrain, the Dodge Charger SRT 392 has been a hot item since its release. One of the two variations of this year’s Charger Daytona model is the 2017 Dodge Charger Daytona, with a 5.7-liter V8 HEMI MDS engine with VVT under the hood, producing 370 horsepower and 395 lb-ft of torque. However, the second Dodge Charger variation is the 2017 Dodge Charger Daytona 392, and it is powered by the same 6.4L (or 392 cubic-inch) V8 SRT HEMI MDS engine found in the Dodge Charger SRT 392. With a new exhaust system, new paddle shift technology, and adaptive damping suspension, Dodge brought back a classic with all new duds. The Charger Daytona trims are also the only trims in the lineup that come standard with a cold air intake system by Mopar. To handle all that power, a vehicle needs to also have the best of the best components making up its powertrain. Designed for performance vehicles, the Dodge Charger SRT 392 and Dodge Charger Daytona 392 come with a six-piston Brembo brake system with 15.4-inch Brembo two-piece rotors and six-piston calipers. Together, they improve the brakes’ heat management, thermal capacity, longevity and performance for increased driver capability and handling. To keep the ride comfortable and smooth, along with the adaptive damping suspension system, these 392 trims also come with Bilstein high-performance shock absorbers on Dodge’s sport-tuned suspension, made to improve a vehicle’s balance and steering response. Riding on axles made of lightweight aluminum, the 2017 Dodge Charger SRT 392 comes with 20-inch SRT hyper black forged wheels. The Dodge Charger Daytona rides on something similar, 20-inch hyper black II forged aluminum wheels, and the 2017 Dodge Charger Daytona 392 comes with 20-inch forged aluminum wheels. However, the design choices don’t end there. Dodge is known for its High-Impact Paint (HIP) colors, and for the 2017 model-year, they allow drivers the choice of one of thirteen different paint jobs for the Dodge Charger SRT 392 and Daytona trims, including the exclusive Go Mango, Green Go, TorRed, and others. The 2017 Dodge Charger SRT 392 comes with a “SRT Design” badge, a “SRT Nameplate” badge, and a “392 HEMI” badge that displays the words “392 HEMI” on either the side or hood of the vehicle. In retrospect, although without the SRT name, the Daytona trims come with a “Daytona” I/P badge, a “Daytona” front grille badge, a satin black “Charger” decklid badge, and Daytona decals on the hood, roof, and trunk. 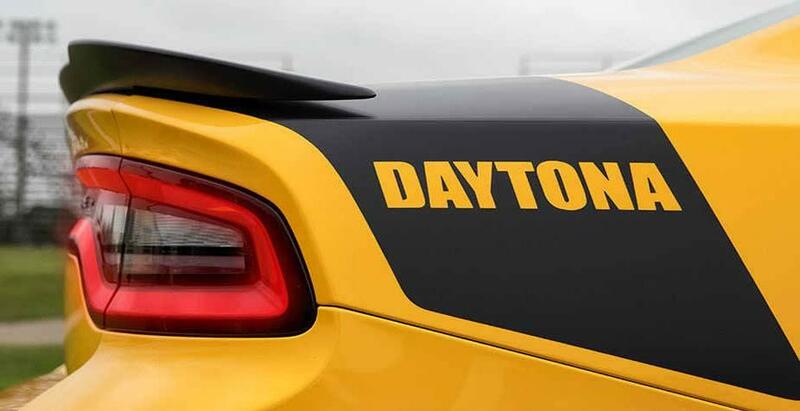 The Daytona 392 does, however, come with a 392 fender decal, the “SRT” grille badge, and a “Powered by SRT” engine cover. For the 2017 Dodge Charger SRT 392, drivers will find room for five people and leather trimmed, heated seats, with the front seats also ventilated. 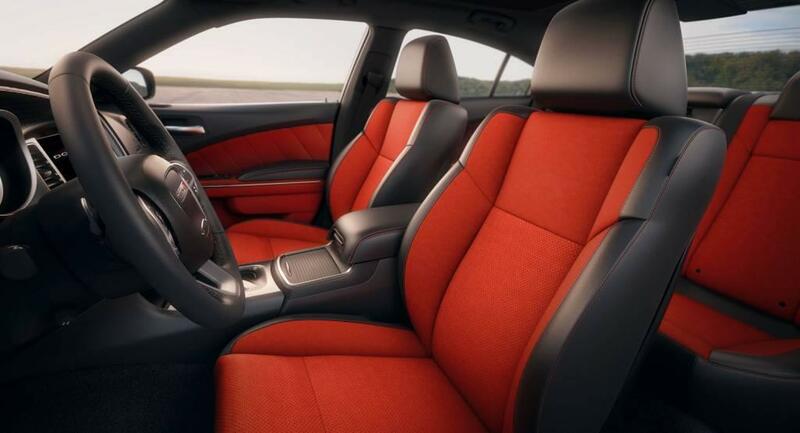 The same can be found on the Charger Daytona trims, with Daytona Performance suede or leather as the seating trim. For the 2017 Dodge Charger SRT 392, consumers have the choice of four different interior colors including a black and red combination. The Daytona trims only come in all-black to contrast the brighter colors available for the exterior. The 2017 Dodge Charger SRT 392 and 2017 Dodge Charger Daytona trims all come with an 8.4-inch touchscreen display, a 6-premium speaker system, Uconnect 4C with Apple CarPlay and Google Android Auto, and Bluetooth connectivity. GPS navigation is optional on the Daytona trims, standard on the Charger SRT 392. Every kind of safety feature one can think of for a performance vehicles comes standard or as an available option for the 2017 Dodge Charger SRT 392 and 2017 Dodge Charger trims. All 2017 Dodge Chargers have a basic limited warranty of three years or 36,000 miles, a limited powertrain warranty for five years or 60,000 miles, and roadside assistance and rust-through coverage for five years or 60,000 miles.